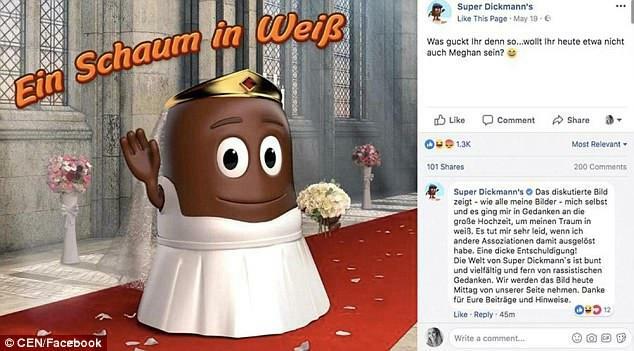 German chocolate company Super Dickmann is being accused of racism after releasing an ad tied to the royal wedding showing a chocolate-covered marshmallow in a wedding dress. The caption to the ad reads: "What are you looking at? Wouldn't you also want to be Meghan today?" the BBC reports. The ad was posted on Facebook on Saturday, the day of Meghan Markle's wedding to Prince Harry. The image depicted a cartoon Schokokuss, a well-known German sweet, dressed in a white dress. The words written above the marshmallow translate to "a foam in white" -- a reference to its creamy interior and a pun on the phrase "a vision in white," according to the BBC. Some criticized the image as "racist" and many took to social media to express their outrage. "Saw Dickmann's commercial and want to set something on fire," one commenter wrote, according to the Daily Mail. The company responded to the criticism on Facebook, writing "A big pardon! The world of Super Dickmann's is colourful and diverse and far from racist thoughts." A spokesperson for the company called the post "stupid and embarrassing," the BBC reports. Super Dickmann spokesman Bernd Roessler said the company had not put enough thought into the post, which it has deleted from its Facebook page. But some people did not think the apology was enough. One wrote, "Pathetic campaign, pathetic response. I hope there will be financial consequences for you," the Daily Mail reports. Markle, now known as Her Royal Highness the Duchess of Sussex, made history as an American and biracial woman when she joined the royal family on Saturday. Markle's mother, Doria Ragland, is African-American, and aspects of the wedding ceremony reflected and celebrated that heritage. The first African-American head of the Episcopal Church in the U.S., Bishop Michael Bruce Curry, delivered an inspiring, emotional sermon. And the renowned gospel singer Karen Gibson led the Kingdom Choir in a soulful rendition of "Stand By Me." Markle, who grew up in Los Angeles during a racially-charged period amid the riots after the Rodney King verdict, has spoken about being exposed to racism up close. "You know, a couple years ago I heard someone call my mom the N-word," Markle said in a 2012 PSA for Characters Unite, a USA Network campaign against discrimination. "I'm biracial … Some of the slurs I've heard or really offensive jokes or names just hit me in a really strong way. ... I'm proud of both sides," Markle continued. To many people, she is an inspiration. "Now we see that a real-life black princess can actually be in the British royal family. So it shows young black girls … that like this can actually be a reality, not just a fantasy, like in story books," 16-year-old Tyler Newman told CBS News' Michelle Miller. "She's not just representing herself, but she's representing all of black women and what we have to bring."